So they are too low for chemo. I can’t say I’m sorry as it gives me the chance to go out for a meal with family some time in the week and go to pizza and Made in Chelsea night with the proper old school girls from high school, which I am really looking forward to! The book I am reading is called “the life and works of Esther Grace Earl”. She is named after a courageous biblical Queen. Not only do I love that, but also love that the name Esther means “star” and so the book is called “This Star Won’t Go Out”. 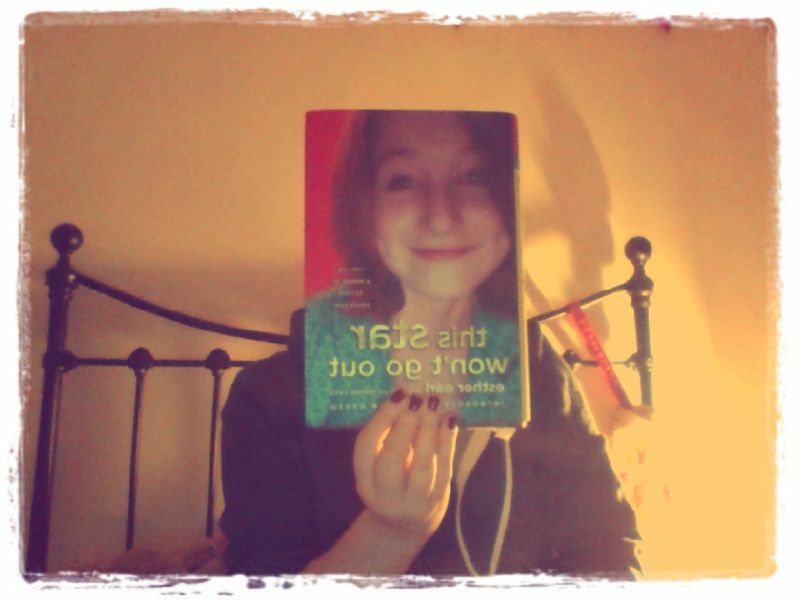 She also happens to be a HUGE John Green fan (aka Nerdfighter) – she even met him once at a Harry Potter convention. As we all know (unless ‘we’ have been living under rocks for the last year or so, tut tut) John Green wrote a book called The Fault In Our Stars. I love how it all ties in. At age 12 Esther was diagnosed with Thyroid cancer. She suffered many complications and gruelling side effects from chemo. I suppose it is morbid curiosity that led me to buying and reading this book, but I am so glad I did. Firstly, because she has some of the same lightbulb/deep moments and thoughts which I have had (and just average thoughts like “nuh uh don’t you go poking that needle in my arm doctor”). It’s oddly reassuring and at times I feel a weird connection with her and probably other cancer patients, knowing that my experience is normal and others feel the same. Secondly, because she has been through a heck of a lot worse than me. There are many times when I am thankful that I have leukaemia, because there are so many more worse things that I could have. It puts life into perspective and reminds me to think of others before myself. Thirdly, she inspires me to write. As much as I hate to admit it (I thought I was an ok writer but at age 9 this girl’s poems put my 16 year old ramblings to shame!) I could go on. This Star Won’t Go Out is a non-profit organisation, led by the late Esther’s parents which is helping american families cope financially when struggling with medical bills from a child with cancer. When you think that we get all of our treatment for free in the UK and next to that consider how expensive blood and chemotherapy products are, those families need all the help they can get. The book is a collaboration of Esther’s journal, her parents blog entries, words from friends and doctors, pictures and art by Esther which is all fascinating. I am really humbled by the book, and if you don’t mind a slightly random childish narrator at points (she was 12/13 at the time!) it is worth a read. If anyone is interested you can buy it from amazon or contact me through the ask me page if you would like to borrow it. I would love to pass it round people and share the light of this girl whose dream was to be an author, and to use her experience to help people. Both of which have now come true, though she cannot be around to see it all unfolding. I was going to talk about 24 hours in A&E as well but something is telling me to stop here. Tonight I’m praying that Esther’s story will inspire many, and that one day I will be as awesome as her. Great Blog, Becca and yes I was leaking at A&E last night too!!! !